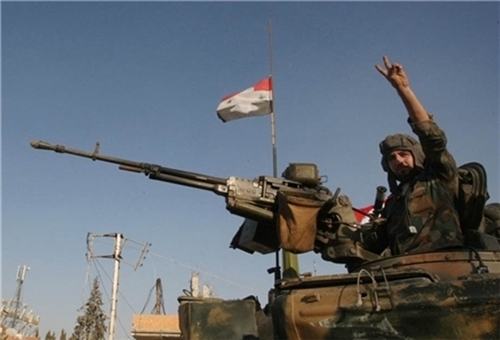 SANA – Syrian Arab Army units continued operations to secure the perimeter of Deir Ezzor Military Airport and Regiment 137, in conjunction with concentrated operations to eliminate ISIS terrorists form the province’s southeastern countryside. SANA’s correspondent said that an army unit that established control over al-Thurda Mountains and met with the Airport’s garrison a few days ago is carrying out demining in the area and securing and clearing landing strips in preparation to resuming safe takeoff and landing operations at the Airport. The correspondent said the Syrian Air Force conducted several sorties targeting movements and positions of ISIS in al-Jnaina, al-Maryaiya, and al-Beghailiya villages, killing and injuring many terrorists and destroying their fortified positions. Meanwhile, local sources in the province’s western countryside said that more ISIS terrorists have fled the area, including ISIS’ “agriculture minister” Abdelrahman Okla al-Aref and one of the leaders of the terror organization’s “Islamic police” Okla al-Aref. Army units, in cooperation with the supporting forces, continued pursuing groups of ISIS terrorists in the eastern countryside of Homs province. regaining control over the towns of Zagroutiyeh, Darwishiyeh, Lwaibdeh, Ghuniman, and Umm Sagh with a front of 12km and a depth of 6km to the north of Manoukh in Jib al-Jarrah area. weapons and equipment, including armored vehicles and machinegun-equipped cars. aforementioned towns, the source added.